It’s been “Don’t look back” since I took a scissors and started my first crab stencil. 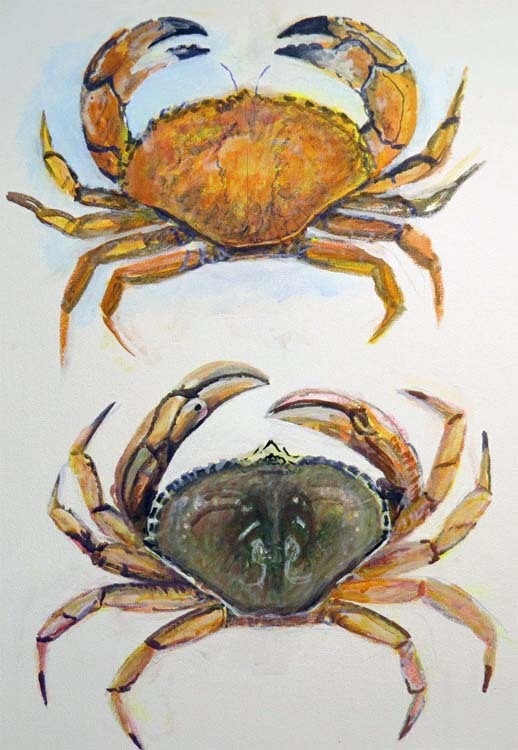 There are 24 Crabs in the Northwest and I have 25% started for a Crabs of the Northwest Poster. 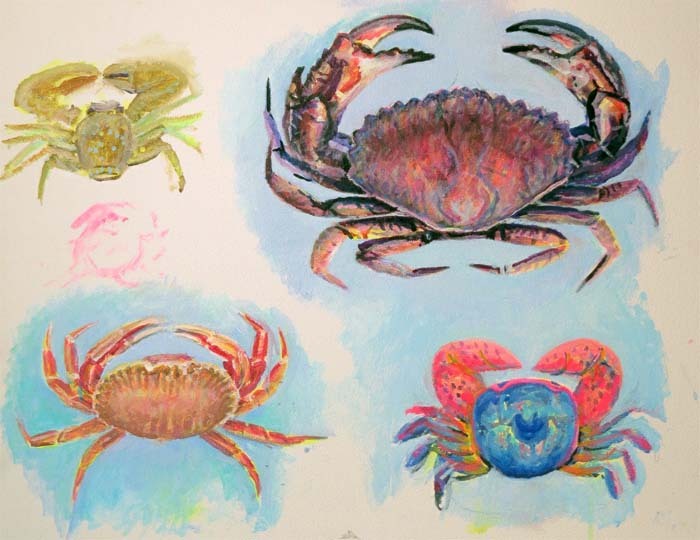 This is one canvas with four species going including the glamorous Red Rock Crab. Mercifully it appears I won’t have to paint an Alaska King Crab, they don’t make it this far south. They look terribly hard to paint, like all lanky animals are. 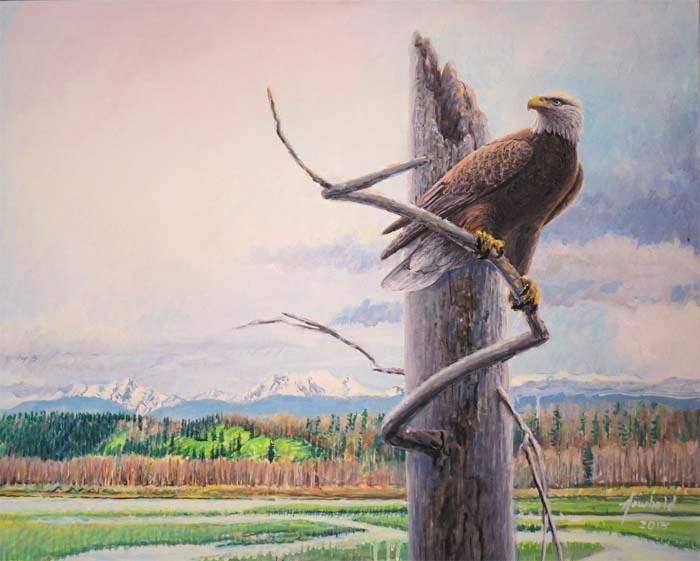 This is Eagle at Spencer, by which I mean Spencer Island behind Everett, WA and needless to say, a Bald Eagle. That’s Three Fingers and White Horse Mountains in the distance. It’s part of my new “NW Romantic” series. It’s not that I don’t like this, I really do, but I’m struggling with it, particularly how to finish the sky. I want clouds, but I want mountains also and those two desires sort of collide with realism and the fact that I have no photographic scrap of cloudy sky where you can still see mountains. May have to let go of the clouds, but then will there be too little going on in the NW quadrant of the painting? Somebody has to worry about these important questions! I’m thinking this may be finished. I’ll get it scanned and published. 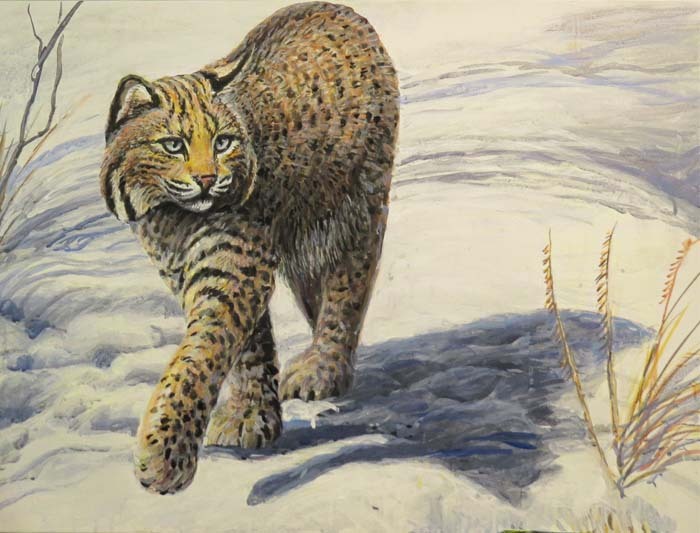 I call it Bobcat Walking but it might just have to be called Bobcat. 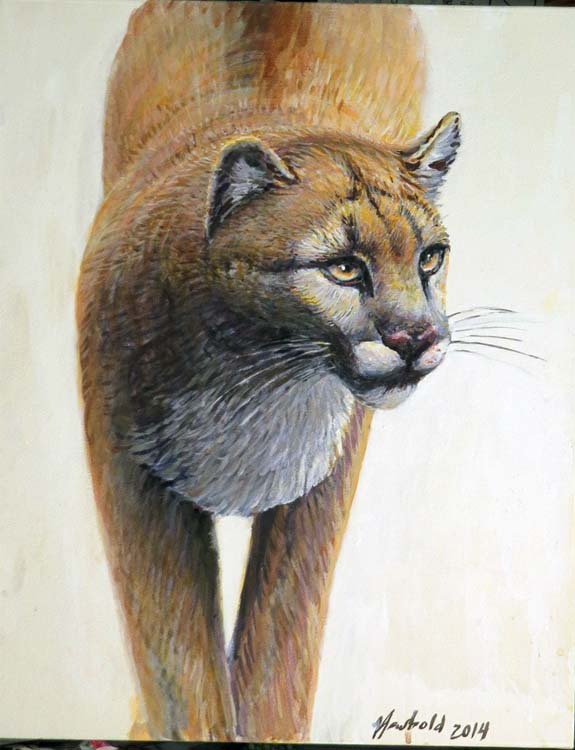 This Cougar has always been a little more troubling yet than the Bobcat painting with it’s extreme closeup “lense-length.” It’s almost done, whether it will ever have a constituency is another question. 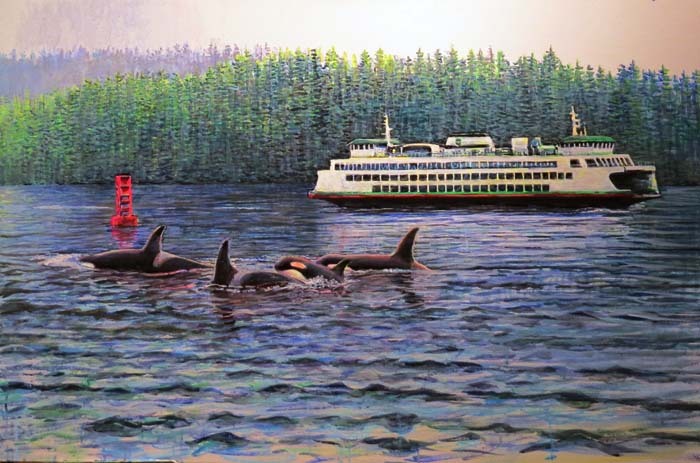 Meanwhile I decided the Evening Passage painting is just too cold and needs red, so even though it further stretches realism-credibility, I’m putting in a red buoy. I’m no pilot, I don’t know anything about where buoys are. I doubt if the positioning of this buoy makes sense in this landscape. But I guess it’s times like these you reach into your back pocket, pull out your wallet, and show the dubious questioner your artists’ license. Regardless of whether it makes sense, it saves the painting from a composition standpoint, giving it a nice S-curve, and from a color balance standpoint, creating an antidote to all that cold blue and green.